A new impact crater that was formed between July 2010 and May 2012, as seen by the HiRISE camera on the Mars Reconnaissance Orbiter. This image is part of “A Fictive Flight Above Real Mars” by Jan Fröjdman. Credit: NASA/JPL/University of Arizona. Mars has some impressive geological features across its cold, desiccated surface, many of which are similar to featured found here on Earth. By studying them, scientists are able to learn more about the natural history of the Red Planet, what kinds of meteorological phenomena are responsible for shaping it, and how similar our two planets are. A perfect of example of this are the polygon-ridge networks that have been observed on its surface. One such network was recently discovered by the Mars Reconnaissance Orbiter (MRO) in the Medusae Fossae region, which straddles the planet’s equator. Measuring some 16 story’s high, this ridge network is similar to others that have been spotted on Mars. But according to a survey produced by researchers from NASA’s Jet Propulsion Laboratory, these ridges likely have different origins. This survey, which was recently published in the journal Icarus, examined both the network found in the Medusae Fossae region and similar-looking networks in other regions of the Red Planet. These ridges (sometimes called boxwork rides), are essentially blade-like walls that look like multiple adjoining polygons (i.e. rectangles, pentagons, triangles, and similar shapes). Such ridges have also been found on Earth, and appear to be the result of various processes as well. One of the most common involves lava flowing into preexisting fractures in the ground, which then survived when erosion stripped the surrounding material away. A good example of this is the Shiprock (shown above), a monadrock located in San Juan County, New Mexico. Examples of polygon ridges on Mars include the feature known as “Garden City“, which was discovered by the Curiosity rover mission. Measuring just a few centimeters in height, these ridges appeared to be the result of mineral-laden groundwater moving through underground fissures, which led to standing mineral veins once the surrounding soil eroded away. At the other end of the scale, ridges that measure around 2 kilometers (over a mile) high have also been found. A good example of this is “Inca City“, a feature observed by the Mars Global Surveyor near Mars’ south pole. In this case, the feature is believed to be the result of underground faults (which were formed from impacts) filling with lava over time. Here too, erosion gradually stripped away the surrounding rock, exposing the standing lava rock. In short, these features are evidence of underground water and volcanic activity on Mars. And by finding more examples of these polygon-ridges, scientists will be able to study the geological record of Mars more closely. Hence why Kerber is seeking help from the public through a citizen-science project called Planet Four: Ridges. Established earlier this month on Zooniverse – a volunteer-powered research platform – this project has made images obtained by the MRO’s Context Camera (CTX) available to the public. Currently, this and other projects using data from CTX and HiRISE have drawn the participation of more than 150,000 volunteers from around the world. By getting volunteers to sort through the CTX images for ridge formations, Kerber and her team hopes that previously-unidentified ones will be identified and that their relationship with other Martian features will be better understood. The incredible HiRISE camera on board the Mars Reconnaissance Orbiter turned its eyes away from its usual target – Mars’ surface – and for calibration purposes only, took some amazing images of Earth and our Moon. Combined to create one image, this is a marvelous view of our home from about 127 million miles (205 million kilometers) away. Alfred McEwen, principal investigator for HiRISE said the image is constructed from the best photo of Earth and the best photo of the Moon from four sets of images. Interestingly, this combined view retains the correct positions and sizes of the two bodies relative to each other. However, Earth and the Moon appear closer than they actually are in this image because the observation was planned for a time at which the Moon was almost directly behind Earth, from Mars’ point of view, to see the Earth-facing side of the Moon. A view of Earth and its Moon, as seen from Mars. It combines two images acquired on Nov. 20, 2016, by the HiRISE camera on NASA’s Mars Reconnaissance Orbiter, with brightness adjusted separately for Earth and the moon to show details on both bodies. Credit: NASA/JPL-Caltech/Univ. of Arizona. Earth looks reddish because the HiRISE imaging team used color filters similar to the Landsat images where vegetation appears red. HiRISE took these pictures on Nov. 20, 2016, and this is not the first time HiRISE has turned its eyes towards Earth. Back in 2007, HiRISE took this image, below, from Mars’ orbit when it was just 88 million miles (142 million km) from Earth. This one is more like how future astronauts might see Earth and the Moon through a telescope from Mars’ orbit. If you look closely, you can make out a few features on our planet. The west coast outline of South America is at lower right on Earth, although the clouds are the dominant features. In fact, the clouds were so bright, compared with the Moon, that they almost completely saturated the filters on the HiRISE camera. The people working on HiRISE say this image required a fair amount of processing to make such a nice-looking picture. You can see an image from a previous Mars’ orbiter, the Mars Global Surveyor, that took a picture of Earth, the Moon and Jupiter — all in one shot — back in 2003 here. See this JPL page for high resolution versions of the most recent Earth/Moon image. For years, scientists have understood that in Mars’ polar regions, frozen carbon dioxide (aka. dry ice) covers much of the surface during the winter. During the spring, this ice sublimates in places, causing the ice to crack and jets of CO² to spew forth. This leads to the formation of dark fans and features known as “spiders”, both of which are unique to Mars’ southern polar region. For the past decade, researchers have failed to see these features changing from year-to-year, where repeated thaws have led to their growth. However, using data from the Mars Reconnaissance Orbiter‘s (MRO) HiRISE camera, a research team from the University of Colorado, Boulder and the Planetary Science Institute in Arizona have managed to catch sight of the cumulative growth of a spider for the first time from one spring to the next. Spiders are so-named because of their appearance, where multiple channels converge on a central pit. Dark fans, on the other hand, are low-albedo patches that are darker than the surrounding ice sheet. For some time, astronomers have been observed these features in the southern polar region of Mars, and multiple theories were advanced as to their origin. In 2007, Hugh Kieffer of the Space Science Institute in Boulder, Colorado theorized that the dark fans and spiders were linked, and that both features were the result of spring thaws. In short, during Mars’ spring season – when the southern polar region is exposed to more sunlight – the Sun’s rays penetrates the ice sheets and warm the ground underneath. This causes gas flows to form beneath the ice that build up pressure, eventually causing the ice to crack and triggering geysers. These geysers deposit mineral dust and sand across the surface downwind from the eruption, while the cracks in the ice grow and become visible from orbit. While this explanation has been widely-accepted, scientists have been unable to observe this process in action. By using data from the MRO’s High Resolution Imaging Science Experiment (HiRISE), the research team was able to spot a small-channeled troughs in the southern region which persisted and grew over a three year period. In addition to closely resembling spidery terrain, it was in proximity to dark fan sites. From this, they determined that they were witnessing a spider that was in the process of formation. Furrows that were similar to the spidery terrain have been spotted at Mars’ north pole in the past, which coincided with a Martian spring. On these occasions, scientists using data from HiRISE instrument reported seeing small furrows on sand dunes, where eruptions had deposited dark fans. However, in what is typical of northern furrows, these were non-persisting annual occurrences, disappearing when summer winds deposited sand in them. In contrast, the troughs Dr. Portyankina and her team observed in the southern polar region were persistent over a three-year period. During this time, these features extended and developed new “tributaries”, forming a dendritic pattern that resembled a Martian spider. From this, they concluded that the previously-observed northern furrows have the same cause – i.e. sublimation causing outgassing. However, they also concluded that the northern furrows do not develop over time because of the high-mobility of dune material in the northern polar region. The difference, it seems, comes down to the presence of erosive sand material in the north and south, which creates (or starts) the erosive process that leads to the formation of spider-like troughs – which both kick-stars the process but can also erase it. In other words, where sand exists beneath the ice sheet, the ground beneath that is likely to be rockier (i.e. harder)> The formation of spider terrain may thereofre require that the ground beneath the ice be soft enough to be carved, but not so loose that it will refill the channels during a single seasonal cycle. 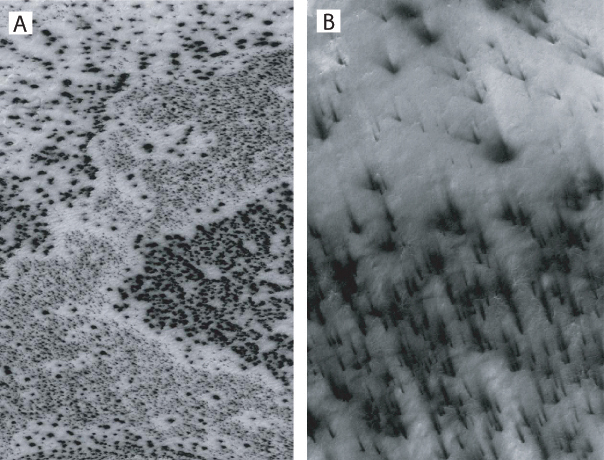 In short, the formation of spidery terrain appears to be dependent upon the difference in surface composition between the poles. In addition, from the many year’s of HiRISE data that has been accumulated, Dr. Portyankina and her team were also able to gauge the current rate of erosion in Mars’ southern polar region. Ultimately, they estimated that smaller spider-like furrows would require a thousand Martian years (about 1,900 Earth years) in order to become a full-scale spider. This study is certainly significant, since understanding how seasonal changes and present-day erosion lead to the creation of new topographical features is important when it comes to understanding the processes that shape Mars’ polar regions. As we get closer and closer to the day when crewed missions and even settlement become a reality, knowing how these processes shape the planet will be fundamental to making a go of things on Mars. We frequently call the HiRISE camera on board the Mars Reconnaissance Orbiter “our favorite camera” and for good reason. HiRISE, the High Resolution Imaging Science Experiment, is the largest and most powerful camera ever flown on a planetary mission, sending back incredibly beautiful, high-resolution images of Mars. While previous cameras on other Mars orbiters can identify objects about the size of a school bus, HiRISE brings it to human scale, imaging objects as small as 3 feet (1 meter) across. Chloride and Paleo Dunes in Terra Sirenum. Credit: NASA/JPL/University of Arizona. MRO orbits at about 300 km above the Martian surface. The width of a HiRISE image covers about about 6 km, with a 1.2 km strip of color in the center. The length of the images can be up to 37 km. If you click on each of these images here, or go to the HiRISE website, you can see the full images in all their glory. To fully appreciate the images, you can download the special HiView application, which allows you to see the images in various formats. HiRISE has been nicknamed “The People’s Camera“ because the team allows the public to choose specific targets for the camera to image. Check out the HiWISH page here if you’d like a certain spot on Mars imaged. Crater Near Hydaspis Chaos. Credit: NASA/JPL/University of Arizona. 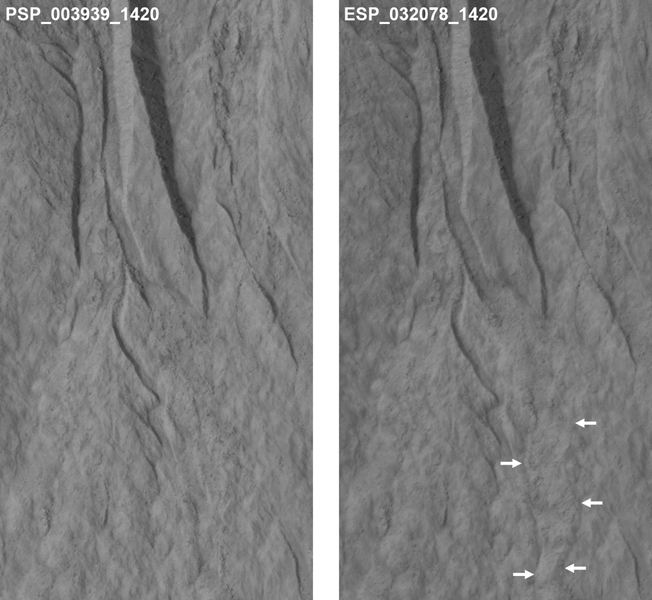 The lead image (the link to the image on the HiRISE site is here) shows a possible recurring slope lineae (RSL), mysterious dark streaks on slopes that appeared to ebb and flow over time. They darken and appear to flow down steep slopes during warm seasons, and then fade in cooler seasons. One possibility is this is evidence of liquid water present on Mars today. Some scientists said it could be a salty, briny liquid water flowing down the slopes. But a recent analysis says the RSLs show no mineralogical evidence for abundant liquid water or its by-products, and so it might be mechanisms other than the flow of water — such as the freeze and thaw of carbon dioxide frost — as being the major drivers of recent RSLs. Check out the full release of images from August 2016 here. Mars today is a planet that appears to be mostly shaped by wind, but that wasn’t always the case. 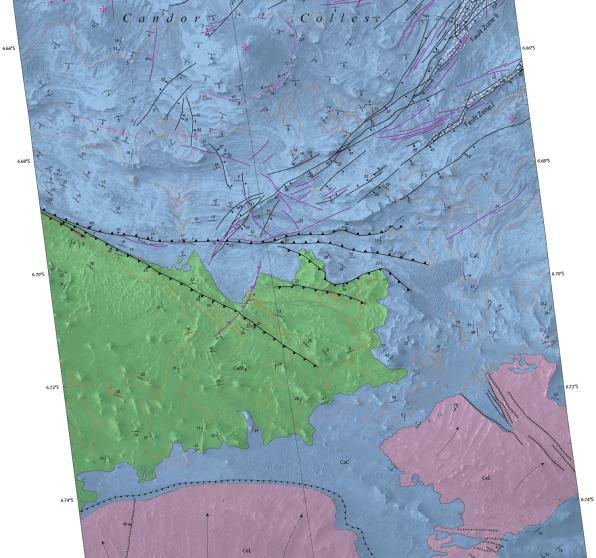 A new map adds information to the hypothesis that “marsquakes” affected at least a part of the planet’s vast canyon, Valles Marineris, while the area contained spring-filled lakes. When the damp sand got shaken up, it deposited itself in hills. NASA says the new map, based on observations from the Mars Reconnaissance Orbiter (which you can see below), adds credence to the theory that it was water that made these deposits. The map you see below was created by the U.S. Geological Survey, which has more extensive information on the findings at this website. The observations also produced a suite of research in recent years, such as this 2009 paper led by Scott Murchie at the Johns Hopkins University Applied Research Laboratory. Here’s the awesome thing about space and social media: in some cases, you can often follow along with a mission almost as soon as the images come to Earth. A group of Canadians is taking that to the next level this month as they take control of the 211th imaging cycle of a powerful camera on the Mars Reconnaissance Orbiter. While some images need to be kept back for science investigations, the team is sharing several pictures a day on Twitter and on Facebook portraying the views they saw coming back from the High Resolution Imaging Science Experiment (HiRISE) camera. The results are astounding, as you can see in the images below. “It’s mind-blowing to realize that when the team, myself included, first look at the images, we are likely the first people on Earth to lay eyes upon a portion of the Martian surface that may have not been imaged before at such high resolution,” stated research lead Livio Tornabene, who is part of Western University’s center for planetary science and exploration. The team will capture up to 150 images between Nov. 30 and Dec. 12, and already have released close to two dozen to the public. Some of the best are below. Does liquid water currently flow on the surface of Mars? Fresh-looking trenches on the Red Planet have come under a lot of scrutiny, including a 2010 study concluding that 18 dune gullies were primarily formed by carbon dioxide freezing. A new study looking at several more gullies comes to about the same conclusion. Researchers examined images of 356 sites, with each of these sites captured multiple times on camera. Of the 38 of these sites that showed changes since 2006, the researchers concluded site changes happened in the winter — when it’s too cold for any liquid water to flow. This image covers a location that has been imaged several times to look for changes in gullies. This is in the Terra Sirenum region, part of the southern highlands in the mid-latitudes. Credit: NASA/JPL/University of Arizona. “As recently as five years ago, I thought the gullies on Mars indicated activity of liquid water,” stated lead author Colin Dundas of the U.S. Geological Survey’s Astrogeology Science Center in Arizona. Observations were made using NASA’s long-running Mars Reconnaissance Orbiter mission, which has been in orbit there since 2006. The researchers said that these lengthy missions are important for examining and confirming findings, because they can revisit data over time and change their conclusions, as needed, as more evidence comes in. Pictures were taken by the High Resolution Imaging Science Experiment (HiRISE) camera. The first images of gullies in 2000 sparked speculation that liquid water could be responsible for changing the surface today. It’s true that Mars has water frozen in its poles, and observations with several NASA rovers show strong evidence that water once flowed on the surface. But, these trenches are unlikely to show evidence that liquid water is flowing right now. “Frozen carbon dioxide, commonly called dry ice, does not exist naturally on Earth, but is plentiful on Mars. It has been linked to active processes on Mars such as carbon dioxide gas geysers and lines on sand dunes plowed by blocks of dry ice,” NASA stated. The team added that smaller features could be the result of liquid water, such as this recent study using MRO. It’ll be interesting to see what other data is churned up as the fleet of orbiters continues making observations, and other scientists weigh in on the results. The work will be published in the journal Icarus. NASA has now released a breathtaking high resolution image of the rover Curiosity captured from Mars orbit coincidentally coinciding with her crossing the targeted landing ellipse just days after she marked ‘1 Martian Year’ on the Red Planet in search of the chemical ingredients necessary to support alien microbial life forms. The orbital image was taken on June 27 (Sol 672) by the High Resolution Imaging Science Experiment (HiRISE) camera on NASA’s Mars Reconnaissance Orbiter (MRO) and clearly shows the rover and wheel tracks at the end of the drive that Sol, or Martian day. You can simultaneously experience the Martian eye view of Curiosity from above and below by checking out our Sol 672 ground level photo mosaic – below. It’s assembled from raw images taken by the mast mounted navigation camera (Navcam) showing the rovers wheel tracks and distant rim of the Gale Crater landing site. The six wheeled robot drove about 269 feet (82 meters) on June 27 traversing to the boundary of her targeted landing ellipse in safe terrain – approximately 4 miles wide and 12 miles long (7 kilometers by 20 kilometers) – for the first time since touchdown on Mars nearly two years ago on August 5, 2012 inside Gale Crater. Curiosity celebrated another Martian milestone anniversary on June 24 (Sol 669) – 1 Martian Year on Mars! A Martian year is equivalent to 687 Earth days, or nearly two Earth years. 1 Martian Year on Mars! To date, Curiosity’s odometer totals over 5.1 miles (8.4 kilometers) since landing inside Gale Crater on Mars in August 2012. She has taken over 165,000 images.